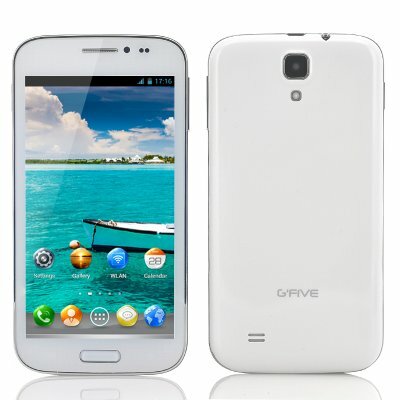 Successfully Added G'Five President G7 5 Inch Android 4.2 Quad Core Phone - QHD HD Multi-Touch Screen, 8MP Camera, 720p Resolution (White) to your Shopping Cart. The G'Five President G7 is a 5 Inch Android 4.2 Smartphone with an 8 megapixel camera, 4GB of ROM, a fast quad core processor, fast 1.3GHz CPU. The first thing you will notice about the G'Five President G7 smartphone is its broad, sensitive touchscreen that bends to the will of your fingers and shines brightly. This is because of the QHD capacitative design, which allows for maximum flexibility, allowing you ease of use and fluidity of motion. Plus the screen looks great, images pop and the swiping is all perfectly in tune to your movement. The President G7 Android phone's processor is commander in chief when it comes to power and speed. Glide through games, videos, and high octane apps with ease, as if you were on a good desktop computer. Although it all fits into your pocket, you'll think you're using something bigger, because the power behind this Quad Core smartphone is enough to handle your work and your whims. Did Someone Call For Reinforcements? Pair that Quad Core processor with 4GB of ROM and 1 GB of Ram, and you have yourself a heavyweight contender (although it only clocks in at 177 grams). Throw whatever you desire at the President G7 quad core phone, it stays calm under pressure. After all, that's what good leaders do. They say every picture is worth a thousand words, but first you need a good camera to capture it. Don't miss another moment with the fast acting, high quality producing 8 megapixel camera that comes with every President G7 cell phone. It's a sharp enough lens to impress your friends, family and even gain some Instagram followers! You can also save your photos, music and videos directly on the 4GB of internal memory that this smartphone has to offer. To help you control this powerful quad core phone is an Android operating system, which is the most popular and widely used smartphone system today as it allows for a whole new level of customization. In stock now, we guarantee that the G'Five President G7 quad core android phone can be dispatched within one working day with a 12 months warranty. Brought to you by the leader in electronic devices and wholesale Android smartphones, Chinavasion.